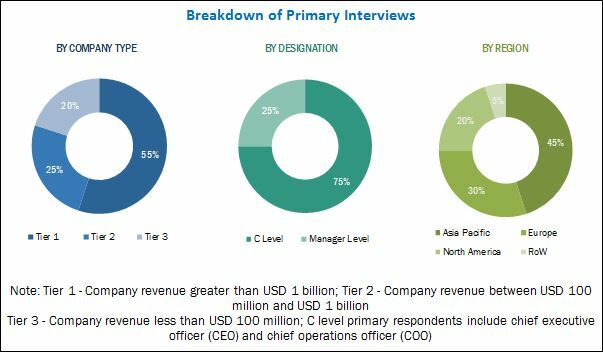 155 Pages Report] The microwave devices market was USD 5.58 Billion in 2016 and is projected to reach USD 8.22 Billion by 2022, at a CAGR of 6.24% from 2017 to 2022. The objectives of this study are to analyze the microwave devices market, along with the statistics from 2017 to 2022, as well as define, describe, and forecast the microwave devices market based on type, frequency, application, and region. The year 2016 has been considered as the base year while 2017 to 2022 has been considered as the forecast period for this study on the microwave devices market. 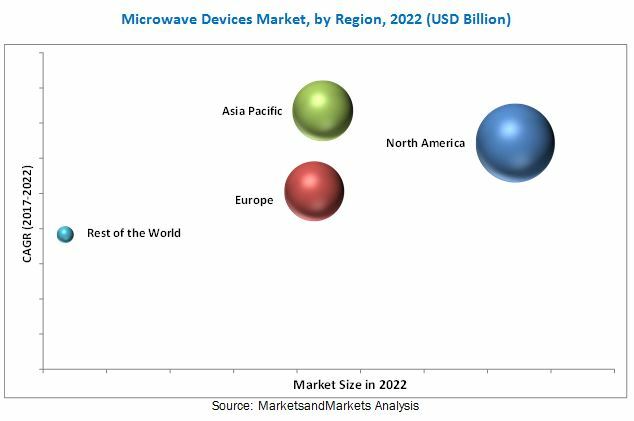 The ecosystem of the microwave devices market includes manufacturers of microwave devices such as Analog Devices (US), L3 Technologies (US), Teledyne Technologies (US), Thales (France), Qorvo (US), CPI International (US), and General Dynamics (US), among others. The microwave devices market is projected to grow from an estimated USD 6.07 Billion in 2017 to USD 8.22 Billion by 2022, at a CAGR of 6.24% from 2017 to 2022. Microwave devices are used in defense, space & communication, and commercial applications. Increasing defense expenditure and R&D activities for the development of new generation defense products have led to an increase in the demand for microwave devices. These devices include various military radars and secure communication products. The microwave devices market has been segmented based on type, frequency, application, and region. Based on type, the microwave devices have been segmented into active and passive microwave devices. Active microwave devices have been segmented into solid state microwave devices and vacuum electron microwave devices. The active microwave devices segment is projected to account for the largest share of the microwave devices market in 2017. The usage of these active microwave devices in various defense electronics and space electronics has led to the growth of the market. Based on frequency, the Ku-band segment is expected to lead the microwave devices market during the forecast period. The demand for the Ku-band is due to the high usage for satellite communication and broadcasting. This band is also used for defense applications for tracking purposes. Based on application, the market has been segmented into space & communication, defense, and commercial. The space & communication application segment accounted for the largest share of the microwave devices market due to its usage on various satellites and space vehicles. The microwave devices market has been studied for North America, Europe, Asia Pacific, and Rest of the World. North America is estimated to lead the microwave devices market in 2017. The Asia Pacific microwave devices market is projected to grow at the highest CAGR during the forecast period. The growth in the region can be attributed to growth in space activities along with increase in defense expenditure. The replacement of traveling wave tube by solid-state microwave devices and consumer disinterest in the upgradation of obsolete systems are restraints in the growth of microwave systems market across the globe, leading to the slow growth of the market. The products offered by various companies operating in the microwave devices market have been listed in the report. The recent developments section of the report includes information on the strategies adopted by various companies between January 2016 and August 2017 to strengthen their positions in the microwave devices market. Communication & Power Industries (US), Thales (France), Teledyne Technologies (US), L3 Technologies (US), and MicroWave Technology (UK), among others, are the major players operating in the microwave devices market.